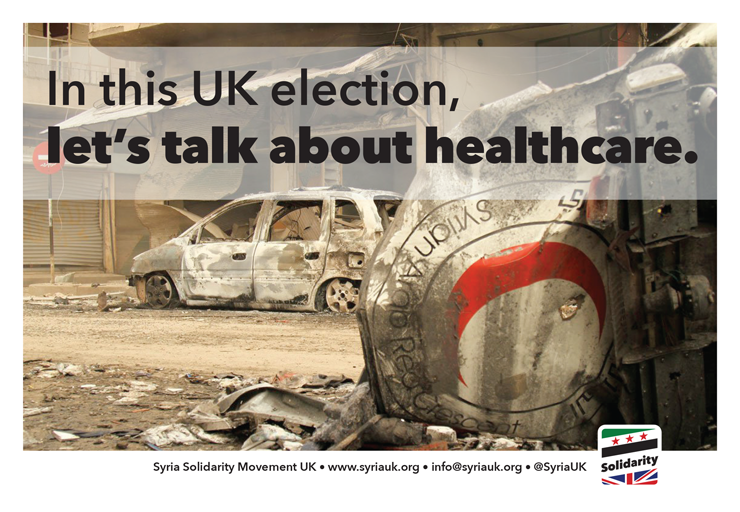 Syria Solidarity UK: In this UK election, let’s talk about healthcare. Aftermath of regime attack on the Hilal Hospital belonging to the Syrian Red Crescent in the city of Idlib, March 29, 2015. Photo by Firas Taki/Anadolu Agency/Getty Images. In Syria, healthcare personnel, medical facilities, and ambulances are deliberately and routinely targeted as part of the military strategy of the Syrian government, according to a recent report by the Syrian American Medical Society. At least 610 medical personnel have been killed, and there have been 233 deliberate or indiscriminate attacks on 183 medical facilities. The Syrian government is responsible for 88 percent of hospital attacks recorded by Physicians for Human Rights, and 97 percent of medical personnel killings, with 139 deaths directly attributed to torture or execution. For people in Syria, life expectancy at birth has plunged from 75.9 years in 2010 to an estimated 55.7 years at the end of 2014, reducing longevity and life expectancy by 27 per cent, according to a March 2015 UN report. Ask any doctor in Aleppo how to help them save lives and their first response is not more aid. 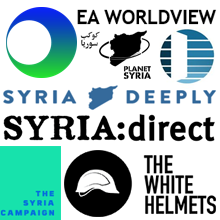 They all say the same thing: “Stop the barrel bombs.” A year ago, I asked a doctor there what he would need if the bombings didn’t stop. “More body bags,” he said. Syria: From bad to worse, by Aitor Zabalgogeazkoa, Head of Mission of the MSF team in Aleppo in 2014, MSF—Médecins Sans Frontières/Doctors Without Borders 7 January 2015. 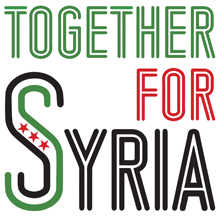 Syrian Medical Voices from the Ground: The Ordeal of Syria’s Healthcare Professionals, February 2015 report(PDF) by the Syrian American Medical Society. ‘If the medics leave, the civilians will die’ – a UK doctor’s story from Syria, by Aisha Gani, The Guardian, 12 March 2015. Syria: In a besieged hospital, sleeping and resting were an impossible luxury, by Dr. S, a young surgeon in a makeshift hospital east of Damascus, MSF—Médecins Sans Frontières/Doctors Without Borders, 13 March 2015. Syria field post: ‘I had to do procedures I’d never seen. YouTube helped a lot’, by Lubna Takruri, The Guardian 16 March 2015. Doctors in the Crosshairs: Four Years of Attacks on Health Care in Syria, Physicians for Human Rights report, March 2015. Syria: Alienation and Violence, Impact of the Syria Crisis (PDF) by the Syrian Centre for Policy Research (SCPR), UN Relief and Works Agency for Palestine refugees in the Near East (UNRWA), UN Development Programme (UNDP), March 2015. Aleppo Diary: The Carnage From Syrian Barrel Bombs, by Samer Attar, Wall Street Journal, 12 April 2015.